The Mergui Archipelago with over 800 islands, some of them the size of Phuket and most of them uninhabited with countless unexplored and pristine dive sites, was opened to foreign visitors in 1997. The Mergui Archipelago is truly one of the last remaining diving frontiers on the planet and is just reachable by live-aboard dive boat or sailing yacht. 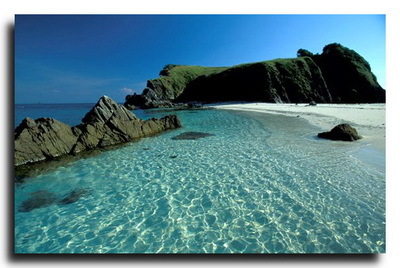 A visit to the Mergui Archipelago remains a true sailing/diving expedition. The uninhabited islands bordered by white sand beaches and dense mangrove swamps are surrounded by sea with excellent visibility, sharks and manta rays, and colorful hard and soft coral gardens at shallower depths with a huge variety of marine life. Here you have the rare privilege of experiencing the beauty and natural wilderness of one of Southeast Asia's last unexplored archipelagos on a luxury 35 meter long schooner "Diva Andaman" with the comfort of a 5 star hotel. With max. 14 other guests you will explore the Mergui Archipelago and the Similan islands. Cruising under sail is the perfect way to appreciate the slow pace and natural beauty of the Andaman sea. During this cruise you will have different activities to choose from, you can learn to dive and get your PADI Diving Certifications or if you're not a diver, you can explore the islands in a kayak or grab your snorkel, mask, and fins and get a dazzling look at the colorful fish and reefs. Below you will find the itinerary for this cruise and also a link for more information about this tour and yacht. Please contact us regarding availability and cruising dates. 02.00 pm – 03.00 pm Transfer to Ranong Pier and boarding. 03.00 pm – 04.00 pm Welcome cocktail, Thai Immigration procedure, safety and trip briefing. 04.00 pm – 06.00 pm Cruising to Kawthoung followed by Burmese Immigration procedure. 07.00 pm – 11.00 pm Dinner on board while cruising to the Mergui Archipelago. 07.00 am – 08.00 am Breakfast on board anchored at High Rock. 08.00 am – 10.00 am 1st dive at High Rock. 10.00 am – 02.00 pm Island visit followed by lunch on board while sailing to 3 Islets. 02.00 pm – 07.00 pm 2nd and 3rd dive at 3 Islets. 07.00 pm – 03.00 am Dinner on board while cruising to Black Rock. 07.00 am – 08.00 am Breakfast on board anchored at Black Rock. 08.00 am – 12.00 pm 4th and 5th dive at Black Rock. 12.00 pm – 02.00 pm Lunch on board anchored at Black Rock. 02.00 pm – 06.00 pm 6th and 7th dive at Black Rock. 06.00 pm – 07.00 am Dinner on board while cruising to the Burma Banks. 07.00 am – 08.00 am Breakfast on board anchored at the Burma Banks. 08.00 am – 12.00 pm 8th and 9th dive at the Burma Banks. 12.00 pm – 02.00 pm Lunch on board sailing at the Burma Banks. 02.00 pm – 03.00 pm 10th dive at the Burma Banks. 03.00 pm – 01.00 am Sailing to Fan Forest followed by dinner on board. 07.00 am – 08.00 am Breakfast on board anchored at Fan Forest. 08.00 am – 12.00 pm 11th dive at Fan Forest and 12th dive at Western Rocky. 12.00 pm – 02.00 pm Lunch on board anchored at Western Rocky. 02.00 pm – 07.00 pm 13th and 14th dive at Western Rocky. 07.00 pm – 11.00 pm Sailing to Shark Lagoon followed by dinner on board. 07.00 am – 08.00 am Breakfast on board anchored at Shark Lagoon. 08.00 am – 10.00 am 15th dive and island visit at Shark Lagoon. 10.00 am – 03.00 pm Lunch on board while sailing to Kawthoung. 03.00 pm – 04.00 pm Burmese Immigration procedure. 04.00 pm – 05.00 pm Cruising to Ranong followed by Thai Immigration procedure. 05.00 pm – 03.00 am Cruising to Richelieu Rock followed by dinner on board. 07.00 am – 08.00 am Breakfast on board anchored at Richelieu Rock. 08.00 am – 12.00 pm 16th and 17th dive at Richelieu Rock. 12.00 pm – 02.00 pm Lunch on board anchored at Richelieu Rock. 02.00 pm – 03.00 pm 18th dive at Richelieu Rock. 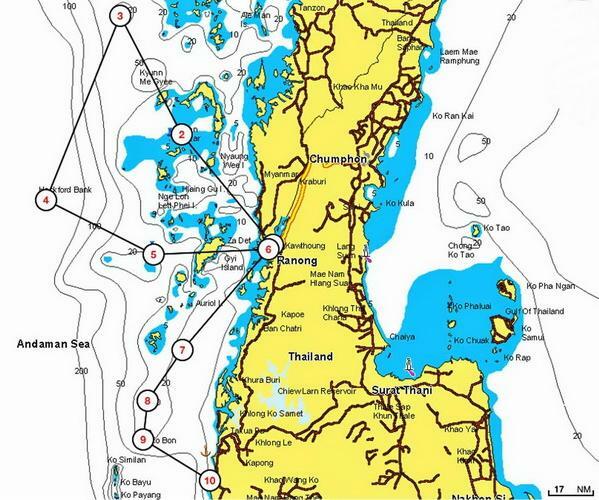 03.00 pm – 07.00 pm Sailing to Koh Tachai. 07.00 pm – 10.00 pm Dinner on board anchored at Koh Tachai. 07.00 am – 08.00 am Breakfast on board anchored at Koh Tachai. 08.00 am – 12.00 pm 19th and 20th dive at Koh Tachai. 12.00 pm – 02.00 pm Lunch on board while cruising to Koh Bon. 02.00 pm – 07.00 pm 21st and 22nd dive at Koh Bon. 07.00 pm – 11.00 pm Dinner on board while sailing to the North Similans. 07.00 am – 08.00 am Breakfast on board anchored at the North Similans. 08.00 am – 12.00 pm 23rd and 24th dive at the North Similans. 12.00 pm – 02.00 pm Lunch on board anchored at the North Similans. 02.00 pm – 07.00 pm 25th and 26th dive at the North Similans. 07.00 pm – 10.00 pm Dinner on board while sailing to the Central Similans. 07.00 am – 08.00 am Breakfast on board anchored at the Central Similans. 08.00 am – 12.00 pm 27th and 28th dive at the Central Similans. 12.00 pm – 02.00 pm Lunch on board anchored at the Central Similans. 02.00 pm – 07.00 pm 29th and 30th dive at the Central Similans. 07.00 pm – 03.00 am Dinner on board cruising back to Phuket. 07.00 am – 08.00 am Breakfast on board anchored at Phuket. 08.00 am – 09.00 am Disembarking at Chalong in Phuket. Please click the link below for more information about this cruise and the yacht. More information about this cruise & yacht.